All criminal charges were dropped against "Empire" actor Jussie Smollett in Chicago Tuesday, nearly two months after the actor was accused of staging a hate crime attack on himself to further his career. 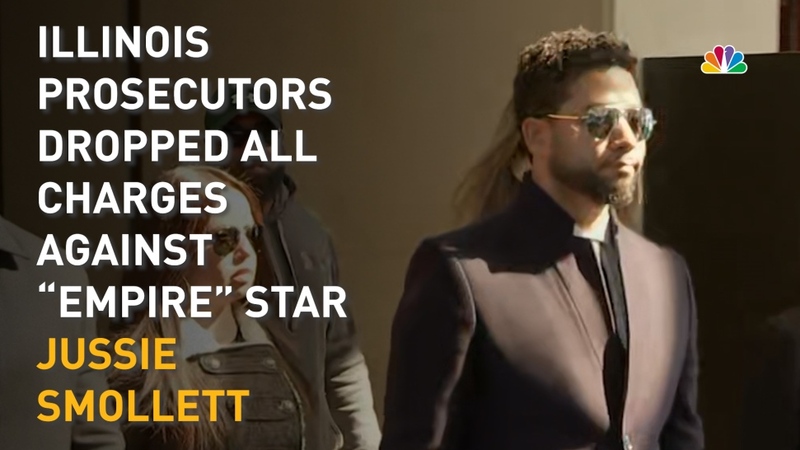 The surprise decision, which was celebrated by Smollett and his legal team and blasted by the city's mayor and police department, came during an "emergency court appearance" where prosecutors not only dropped the charges against Smollett but agreed to expunge the actor's record. "Jussie was attacked by two people he was unable to identify on January 29th. He was a victim who was vilified and made to appear as a perpetrator as a result of false and inappropriate remarks made to the public causing an inappropriate rush to judgment," attorneys Tina Glandian and Patricia Brown Holmes said in a statement. "I would not be my mother's son if I was capable of one drop of what I was accused of," he told reporters outside the courtroom. "I would not bring my family, our lives, or the movement through a fire like this," he added. "I just wouldn't." Chicago Mayor Rahm Emanuel and Police Supt. Eddie Johnson hammered the decision, saying they were unaware it was happening. Johnson added, "Do I think justice was served? No...I think this city is still owed an apology." Tandra R. Simonton, the chief communications officer for the Cook County State's Attorney's Office, said the resolution in the Smollett case was not "new or unusual." "An alternative disposition does not mean that there were any problems or infirmities with the case or the evidence. We stand behind the Chicago Police Department's investigation and our decision to approve charges in this case," Simonton said. "We did not exonerate Mr. Smollett. The charges were dropped in return for Mr. Smollett's agreement to do community service and forfeit his $10,000 bond to the City of Chicago. Without the completion of these terms, the charges would not have been dropped. This outcome was met under the same criteria that would occur for and is available to any defendant with similar circumstances." State's Attorney Kim Foxx recused herself from the case in February, with documents obtained earlier this month via Freedom of Information Act request showing that Foxx had asked Johnson to turn the investigation over to the FBI. The Chicago Police Department said it found out about the latest news during a graduation ceremony for recruits. "It’s a punch in the gut. Is absolutely a punch in the gut," said Commander Ed Wodnicki. "We worked closely throughout our three-week investigation to get to point where we arrested the offender. For the state's attorney at this point to dismiss charges without discussing this with us at all is just shocking." Smollett pleaded not guilty to multiple disorderly conduct charges earlier this month. He was initially charged with one felony count of disorderly conduct in filing a false police report in February, with Chicago police alleging that he staged a hate crime attack on himself the month before because he was "dissatisfied with his salary." A Cook County grand jury then indicted Smollett on 16 felony counts. The lawyer for the brothers, Obabinjo Osundairo and Abimbola Osundairo, said the pair had evidence backing their claim that Smollett orchestrated the attack. Smollett's lawyers said "misinformation" had been reported in the case and they planned to prove a lack of evidence in the case. A representative for the brothers' legal team said their attorneys were reviewing the latest developments. Among the questions that have gone unanswered are whether prosecutors still believe Smollett concocted the attack or whether there’s new evidence that altered their view of events. In an interview with NBC 5, First Assistant State's Attorney Joseph Magats said Smollett is "not a victim of a hate crime" and noted that dropping the charges "did not exonerate" him.